These definitely aren’t your “average” chips. They’re delicious, easy to make, and best of all—nutritious. Remove the stems, put a bunch of kale on a cookie sheet, drizzle with olive oil and salt, cook at 350F for 10-15 minutes (until crispy), and enjoy. Plain Greek yogurt can be, well, plain. Plain Greek yogurt with maple syrup, chopped peanuts, and sliced strawberries, however, tastes like a sweet dessert. You can create your own trail mix and pre-portion out the snack sizes by mixing nuts, raisins, goji berries, and cacao chips. It’s the perfect blend of sweet, salty, and crunchy goodness. Instead of ice cream, there’s NICE CREAM (it’s a thing, really). Blend a frozen banana with nut butter, unsweetened cocoa, and frozen dark cherries for a healthy banana-based alternative to ice cream. Some of our favorite nice cream recipes are on the Pop Sugar blog here. 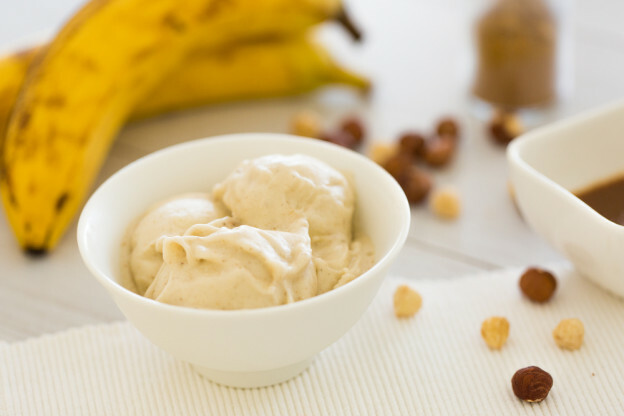 You don’t have to bake this high-protein snack and it will satisfy your peanut butter craving (bonus that it tastes like a cookie). Freeze and eat at your convenience. Mix together fresh salsa and cottage cheese to create a creamy dip, then serve with crackers, whole wheat tortilla bread, or veggies. Munching is inevitable, but with a little preparation, you can snack better and boost your energy this spring. For more information on how to make positive changes in your habits that will help you stay active and healthy throughout the aging process, download Vista Prairie’s free guide: Keeping Healthy as You Age.